Go on a spirit journey and learn the ways of the forest. Brackenleaf — Join Brackenleaf's Briars. I've discovered an order of hunters called Brackenleaf's Briars. They protect a tree they say was planted by Y'ffre at the creation of the world. 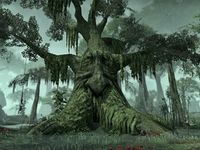 Talk to Glaras about becoming a Brackenleaf Briar. Choose your spirit animal, hunt your prey and confront your predator. Take a piece of Brackenleaf's heart. Pray at your spirit animal's shrine. Eringor appears before you enter Brackenleaf. If you want to become a Brackenleaf Briar, you must talk to Glaras, the leader of the Briars. You need to light the brazier at each of the three animal's areas and watch a vision of its prey and predator. The Snake kills the Wolf, the Wolf kills the Tiger and the Tiger kills the Snake. The Snake uses stealth, the Tiger uses strength and the Wolf uses teamwork. The next step is to catch and eat alive a Falinesti Peeper to see the true nature of the forest. The frog is northeast of Glaras' house, inside Sacred Leap Grotto. You must run up to it and interact with it before it hops away. Once caught, a prompt to "Use Falinesti Peeper" should appear. This allows you to start the vision journey. After that you are approached by a spriggan spirit. She tells you that it is time to speak to Brackenleaf. He can be found to the west, outside of the Grotto. He asks you to pick a spirit animal based on the qualities that fit you best. Then, you will have to destroy the animal's prey. 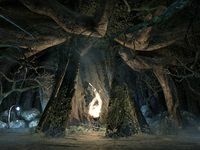 Once this is done, the spriggan spirit will appear and tell you to go to the animal's shrine at the edge of the forest. There you confront your animal's predator. Once you are done, you need to return to Brackenleaf who says that you are the Outsider. You must defeat the masters and touch Brackenleaf's heart to become a Briar. You will have to take a piece of Brackenleaf's heart and return to Glaras who sends you to pray at your spirit animal's shrine. Returning to Glaras completes your initiation into the Briars. Choosing a spirit animal is permanent for your character and will provide you with the ability to get a one-hour buff any time you pray at a Brackenleaf shrine. This page was last modified on 16 December 2018, at 13:28.